Like anyone interested in city life, we at Copenhagenize Design Co. like to keep our eyes on the street life of our city. Currently however, the City of Copenhagen is planning to take some away from the street, by forcing people underground, with the 'Cityringen' expansion of the Metro. Instead of investing in the reestablishment of our tram network - so rudely removed by the ironically-named mayor Urban Hansen in the 1970s - like cities all over Europe, Copenhagen seems keen to get people off the street. This doesn’t come cheap: 3 billion Euros gets you an additional 17 stations added to the existing Metro network. In a nice circle shape. Perhaps some of the cost can be explained by the fact that It is not easy to build a Metro in Copenhagen, a city that is on the whole scarcely above sea level, and with a dense urban fabric too. It's due for completion in 2018, but that's later than the initial estimate and with the date still some way off who knows whether it will actually be ready by then - just ask the planners in Amsterdam, where a new metro line has been under construction since 2002 and is still not finished, although it was supposed to have been operating for several years by now. As well as that, Amsterdam's costs more than doubled from initial estimates. But this article is not only about the Metro extension in Copenhagen; it deals with the question of which kinds of transportation are needed to support cities in becoming more liveable. We realise that we won't be stopping the Metro, but we are keen to highlight - even years before it's finished - that it ain't "all that". The projections for the Metro also have an alarming statistic buried in the paperwork. Cycling levels in Copenhagen are expected to drop by an estimated 2.8%. That is a lot of cyclists we'll be losing. We know what people want. We want to move fast, safe and cheap from A to B. Also, the transportation system has to be sustainable, namely environmentally friendly, at a reasonable cost to society and it should not exclude anyone. Since we are hands-on people here at Copenhagenize, we decided to just test it ourselves. We were curious how the different transport modes score compared to each other and especially how the bike performs against trains, buses and the new Metro. What we did was simple. For some days we tracked all our journeys from our homes to the Copenhagenize office (and vice versa) or other routes with the GPS-based App Endomondo. A great app - also because it includes Cycling - Transport as an option. Not surprisingly, it's a Danish app. Sometimes we came by public transport, sometimes, as normal, by bike. As the new metro is not operating yet, we had to be a bit creative when comparing it to the bike. We built scenarios to challenge the totally unrealistic times which are published on the project website of the Metro extension. If false advertising is a thing, the Metro are guility of it. "7 minutes from Nørrebro Runddel to Enghave Plads! ", they declare, without anyone bothering to check if it's true. Until now. To be clear about that point: It is probably very realistic that the time you will need to spend on the metro carriage itself between the future stations Nørrebro Runddel and Enghave Plads is seven minutes. The unrealistic part about that is that nobody lives or works in those stations. And then comes the time you actually spend in the train, followed by the fact that it will take another minute (again, on average based on our timings) to get off the Metro and reach the street level again. Lastly we added the walking time from the station to an address in a potential working area, again in a range of less than one kilometre to the Metro station. As you can imagine, a trip incorporating the journey from Nørrebro Runddel and Enghave Plads doesn't take seven minutes any more. Here you can see the results of our Bike vs. Metro study. For the bike trips we assumed that we were travelling at an average speed of 16kph, which is the average pace people cycle in Copenhagen. Very relaxed, without having to sweat, and doable for all cyclists. We also added two minutes to unlock, park and lock the bike. The results are impressive: in three out of five scenarios the bike is faster door to door than the Cityringen line will ever be. In one scenario there is a tie between Metro and bike and in only one instance is the Metro slightly faster. The longer you have to walk to and from the station (last mile) the higher are the chances that the bike will be faster. From our data we see that 700m can be seen as a threshold: if you take the metro to work and have to walk more than 700m (about 10 minutes) on the way from door to door, you almost certainly would have been faster by bike. We're asking why the City of Copenhagen and the Danish government put so much money into something which does not bring a significant advantage to the people in the city? We're not saying that a Metro never makes sense. There are cities where the Metro is an indispensable element in the transportation system, carrying millions of people a day, like in London, Paris or New York. But does it make sense in cities like Copenhagen or Amsterdam, where you can reach almost everything in the centre within 20 minutes on a bike? Of course, we understand that not everybody is able to ride a bike. And we definitely want a transport system which does not exclude anybody. So, where is your tram, Copenhagen? Imagine what a fantastic tram network we could have for €3 billion. Look at France, where new tram systems are popping up like mushrooms. Also, there would be plenty of money left to further improve the cycling infrastructure within the city. What we get now is a new line with 17 stations which runs in a circle and only connects to other lines at two points. 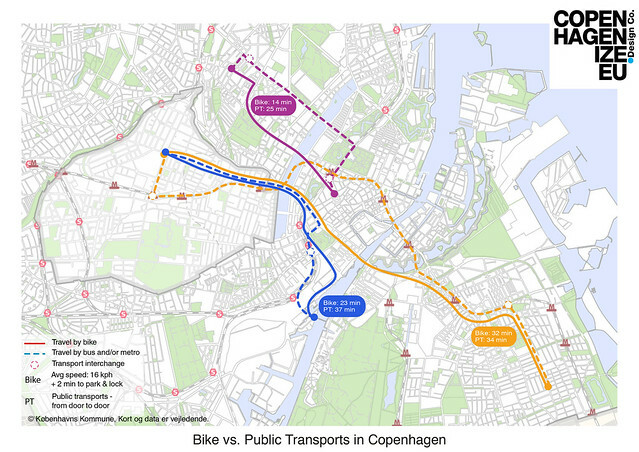 It doesn't seem like the main effect of this project will be to make Copenhagen more liveable. The City of Copenhagen is clearly afraid of reducing car traffic. Despite the goodness in the city, they still are intent on maintaining the car-centric status quo. Back to the competition: What about our commuting trips we tracked? Also in those cases the bicycle is highly competitive as you can see in the graphics below. On trips less than ten kilometres the bike is usually the fastest option. 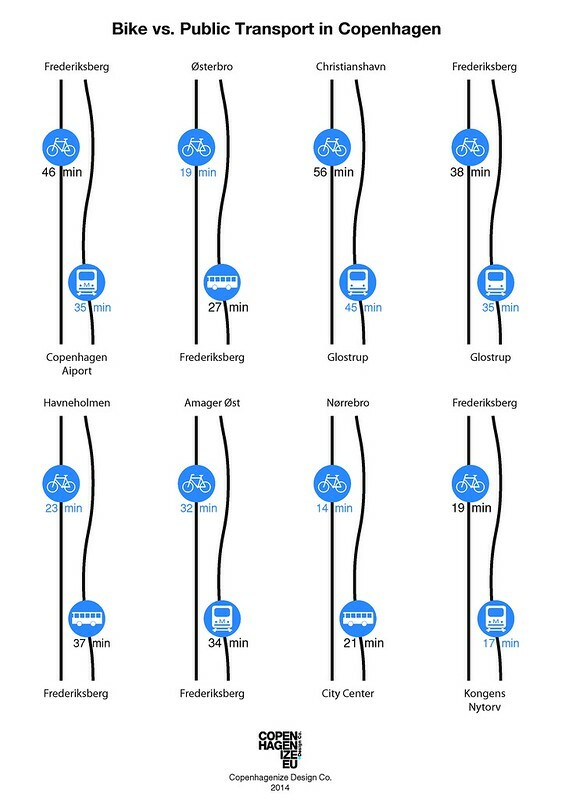 The longer the trips are, for example from Frederiksberg to the Airport at Kastrup or from Glostrup to the new Copenhagenize office on Papirøen (Paper Island on the Harbour), the better public transport scores. That makes sense and it is also in line with the fact that cycling drops significantly for trips longer than eight kilometres. But we also have to mention that we set the average speed for cyclists even on the longer commuter trips to 16kph. It can be assumed however, that commuters who cycle everyday between 10 and 15 kilometres to work are faster than that. 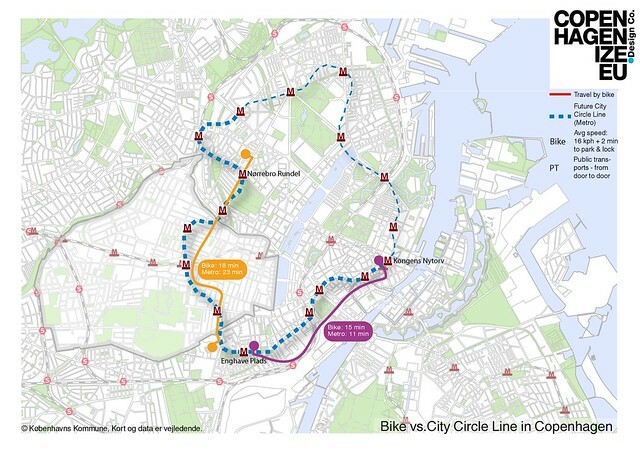 The bicycle superhighway network for greater Copenhagen for instance is designed for an average speed of 20kph. And then, the bicycle is even very competitive up to distances around 15 kilometres. 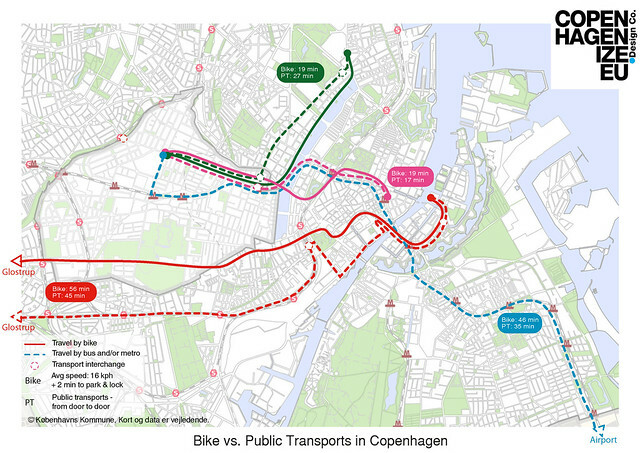 So, what’s the message of our short study about getting from A to B in Copenhagen? First: there's no obvious need to invest billions in mega projects if the effect is as small as in Copenhagen’s current Metro extension project. Secondly: Invest the money instead in cycling infrastructure. 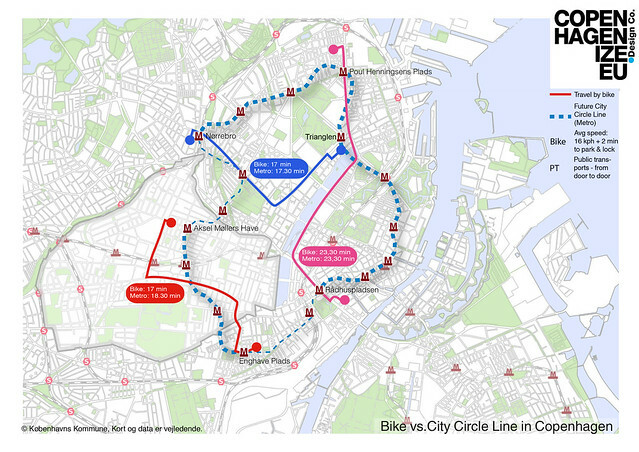 Our little experiment has shown again that the bicycle is the best mean of transport to get from A to B in a city. And thirdly: Invest in public transport solutions which cover a larger geographical area at a lower cost. Like trams or light rail. And lastly, you might wonder why we did not include the car in our comparison. Well, because a car wouldn't make sense at all for daily trips in a city and because only 14% of Copenhageners transport themselves by car each day.